US Secretary of State Mike Pompeo began a four-nation tour of Latin American allies Friday, arriving in Paraguay after talks in Santiago with Chile’s President Sebastian Pinera that focused on Venezuela and the growing commercial influence of China. Pompeo arrived in Asuncion late Friday on the second leg of his trip, greeted by Paraguay’s Foreign minister Luis Castiglioni. He was to hold talks with President Mario Abdo Benitez and his counterpart Castiglioni on Saturday before heading to Peru. 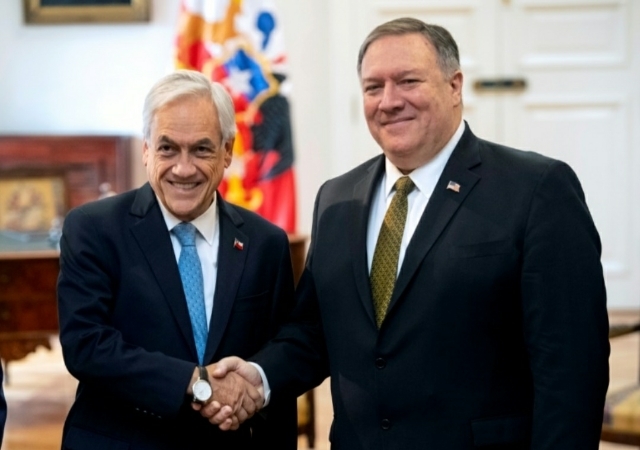 Earlier Friday in Santiago, Pompeo thanked Chile “for being a true leader for the Venezuelan people” in taking in around 300,000 refugees fleeing President Nicolas Maduro’s embattled socialist regime. “I want also to applaud President Pinera for helping isolate Maduro and for showing compassion towards innocent people fleeing the economic and humanitarian crisis in their home country,” Pompeo said in a speech. The US has repeatedly warned Maduro that “all options” remain on the table to bring about a resolution to the crisis. Maduro has blasted this statement as a clear threat of military intervention. The highlight of Pompeo’s trip will be a brief visit Sunday to the Colombian city of Cucuta on the Venezuelan border, where he will meet refugees. All four countries on his itinerary are led by right wing or centre-right leaders favourable to Washington’s uncompromising approach to Maduro. Pompeo’s visit is partly aimed at blunting trade rival China’s growing reach in Latin America, where Beijing is Chile’s biggest trading partner, representing 30 percent of Santiago’s exportsmainly raw materials such as copper and agricultural products. By comparison, the US accounts for only 14 percent of Santiago’s exports. The US official said before landing in Chile that the current US administration had “spent a lot of time” in Latin America seeking to improve trade in a region which has turned its back in recent years on a slew of leftist governments. Of concern to the US is Chile’s contracts with Huawei, the Chinese tech giant which Washington has long considered a security threat. It has already severely restricted the Shenzhen-based company’s presence in the United States, suspecting its products could be used to spy on Western governments. But he added: “It is not okay to put technology systems in with latent capability to take information from citizens of Chile or any other country and transfer it back to President Xi’s government.